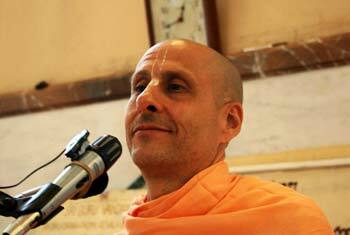 Question to Radhanath Swami – How do you consider yourself: Do you consider yourself a monk? Do you consider yourself a particular enlightened spiritual guide? How do you consider yourself in terms of your mission in life? Radhanath Swami Answers – I consider myself very fortunate. 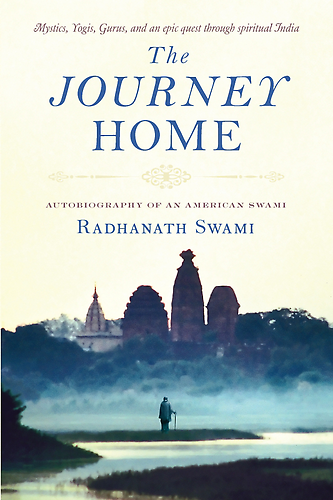 I have role of a swami and a monk and that is the service I have taken in my life. The concept of a swami or a monk in our tradition is that we accept the vow of celibacy and we accept a life where we don’t have any property or anything that is our own, as far as material things are concerned. The idea is that, in order to give our whole energy to the whole world, according to our capacity, we give up the responsibility of a small family so that we can serve the whole human family. So, the idea of renunciation is for the purpose of seva or service. Now you can do the same service practically living in the family life. In Chowpatty temple, there is a congregation of about 10,000 and there is one swami who lives here and there are around 200 monks. 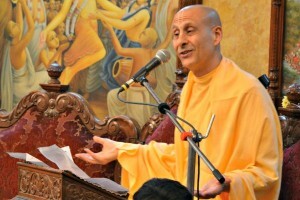 So, the monks and swami encourage and inspire the congregation. In a way the congregation is doing so much to help us and we are doing so much to help them and the combination is something very beautiful. Those who are in the renounced life help the family people remain focused. So, in this way, that is a service. This is my role as a swami on the spiritual path that I follow, which is bhakti or the path of devotion, specifically, Krishna devotion. But how do I consider myself? I consider myself very grateful that I have been given the opportunity to dedicate my life to this service. I find no greater pleasure, no greater wealth than the opportunity to serve, to really try to make some difference in other people’s lives, especially in the spiritual way. So, I would just like to be the servant of the servant of the servant of all other servants, whatever role I may be in. That is how I see myself.